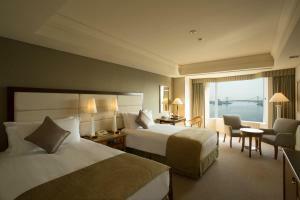 InterContinental Tokyo Bay features spacious rooms, 8 restaurants and concierge services. Facilities include a massage salon, a hairdresser and charged private parking. It’s connected to Takeshiba Station, and a 5-minute ride from Hamamatsu-cho Train Station by complimentary shuttle. Comfortable, air-conditioned rooms are fitted with an LCD TV with satellite channels, a fridge and an attached bathroom with toiletries. 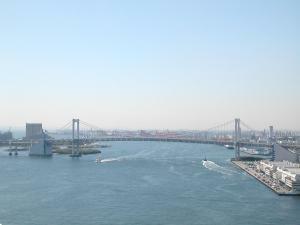 Some offer views of Tokyo Bay or Sumidagawa River. 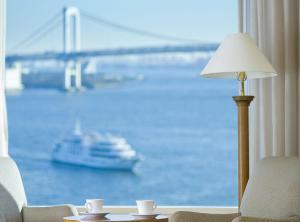 InterContinental Tokyo Bay has a 24-hour front desk, and it offers laundry service and private check-in/check-out. WiFi is available at extra charge. Buffet restaurant Chef’s Live Kitchen offers ocean views and delicate international cuisine, while La Provence serves authentic dishes from the south of France. Traditional Japanese flavours are featured at Waketokuyama. Guests can enjoy drinks and snacks at the bar and New York Lounge. 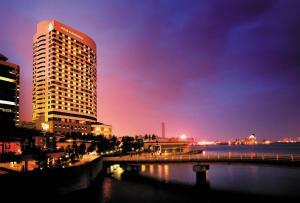 InterContinental Tokyo Bay is a 20-minute train ride or chargeable limousine bus ride from Haneda Airport, and a 10-minute train from Odaiba. Tokyo Big Sight (Tokyo International Exhibition Center) is also 20 minutes by train. At an additional charge, limousine buses depart for Narita International Airport as well, and takes approximately 105-minutes from the hotel. An extra bed or baby bed is not accommodated in the Club King Room with River View and the Club Twin Room with River View. The hotel has a fitness club, which is only accessible for members. This is a spacious, air-conditioned room featuring city views, an interior in neutral colours and a seating area. It's fitted with an LCD TV with satellite channels, a fridge and an attached bathroom with toiletries. The property will allocate a double or twin room type to the guest on arrival; bedding preferences are subject to availability. Please note, requests for specific views from the room cannot be accommodated by the property. Rate: ¥ 20625.00 ... ¥ 57500.00; select dates below to get current rates. Located on the 20th to 24th floor, this spacious, air-conditioned room features views of Sumidagawa River, and includes Club Lounge access with free drinks and free breakfast. It comes with an interior in neutral colours and a seating area. The room is fitted with an LCD TV with satellite channels, a fridge and an attached bathroom with toiletries. This room does not accommodate an extra bed or baby bed. Located on the 18th to 19th floor, this air-conditioned room is fitted with an LCD TV with satellite channels, a fridge and an en suite bathroom with toiletries. This air-conditioned room is fitted with an LCD TV with satellite channels, a fridge and an en suite bathroom with toiletries. The property will allocate a double or twin room type to the guest on arrival; bedding preferences are subject to availability. Located on the 20th to 24th floor, this air-conditioned room is fitted with an LCD TV with satellite channels, a fridge and an en suite bathroom with toiletries. This room is located on the 8th to 17th floor.